As children build their pathways, they predict or hypothesize about the marbles behavior. Placing the marble on the ramp to observe its behavior becomes a test of the children's expectation and the result provides new information for the use in the subsequent tries. We refer to this process as "error informed experimentation." We believe this is how young children construct knowledge and intelligence. In other words, this is how they learn. By fostering this thinking process, children learn to trust their thinking in all areas. The Ramps and Pathways activity requires children to problem solve in order to achieve a specific purpose they have identified. 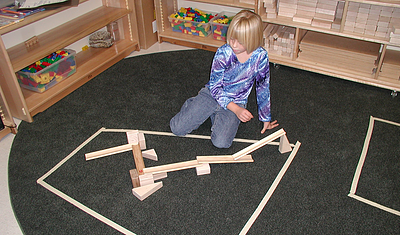 Children turn to engineering as they arrange supports for their structure, maintain its stability, and connect the ramp sections sections to achieve the marble route they envision.